The Seanachie is published annually. The magazine includes short stories, essays, poems, cartoons, photographs and art work. Staff members are always needed and welcome to assist with the selection of pieces, editing, design, and layout. The Irish Times is published quarterly. With additional staff members, the paper could become a monthly. Any student interested in journalism is invited to become part of the staff. Those who do not enjoy writing or editing can always help out by typing copy, paste-up, stapling and selling. Photographers are always needed. Read the latest copy of the newspaper here. 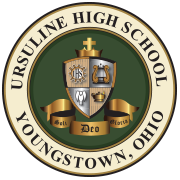 All students from grades 9-12 are invited to join the staff of the Ursuline High School yearbook. Students learn layout and graphic art skills as they have fun producing the annual. Skill in areas such as writing, drawing, and design are helpful but not necessary. Training will be provided.